FREE SHIPPING within the United States, overseas military addresses (APO/FPO/DPO), Puerto Rico and the US Virgin Islands on purchases of over $75; $6.99 shipping for orders under $75. 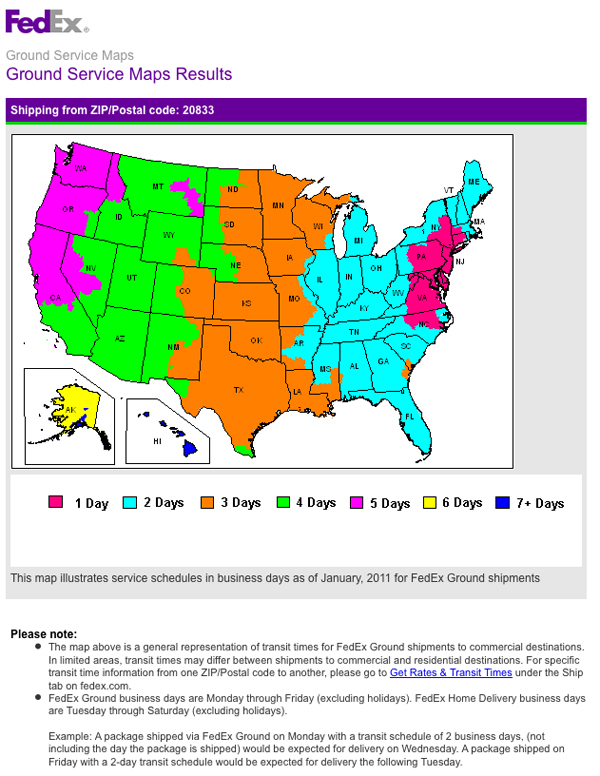 See the map below for estimated shipping days for orders shipped FedEx ground. Orders shipped via USPS priority mail will take 1-3 business days for addresses within the United States. Our shipping department will choose the best carrier to ship your package based off your location and type of address. An email will be sent to you from either FedEx or USPS with your tracking number. All orders are shipped from our facility in Maryland by the next business day. For Canada, Mexico, Australia, and the United Kingdom shipping charges via insured Priority Mail International will be applied to online orders automatically. For all other countries, please call us directly, 001-301-774-2433, for a shipping quote.